Atlanta Ballet company dancers Ivan Tarakanov and Erica Alvarado as 'The Nutcracker's Marie and Prince. Photo by Charlie McCullers, courtesy of Atlanta Ballet. We have arrived upon one of the most anticipated seasons of the year. With the holiday season around us at every corner, it is a season not only of joy but one of tradition. One tradition that is no stranger to the dance world is performing the production of The Nutcracker. This is the show that dancers of all ages and dance levels not only dream of performing in but one that audiences look forward to as December approaches. The Nutcracker is a production that has taken on many forms, while still tying in the whimsical story together in many unique ways. Companies from all over the world pride themselves on their versions of The Nutcracker, and Atlanta Ballet has taken its production of the holiday classic to a whole new level by unveiling a new version of the iconic show. 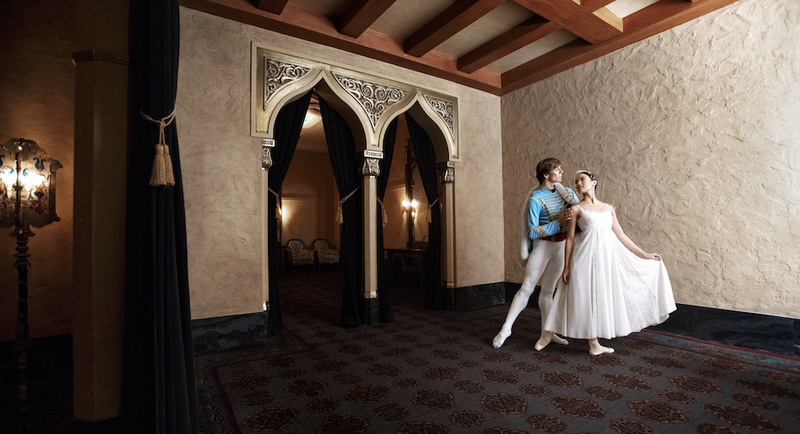 Under the artistic direction of Gennadi Nedvigin, this major milestone for Atlanta Ballet has been two years in the making and one of great anticipation as each detail is carefully put together to bring magic to the Fox Theatre stage. Nedvigin talks to Dance Informa about the beginning stages of revamping The Nutcracker. Atlanta Ballet dancers rehearsing choreography for ‘The Nutcracker’ with Yuri Possokhov. Photo by Kim Kenney. Nedvigin did not hesitate when deciding to partner with internationally acclaimed choreographer Yuri Possokhov, who is known for his narrative works, to bring the new vision to life. With a strong team and overall vision set in place, Nedvigin and Possokhov, along with their powerhouse creative team, set out to develop a new production that would rival any other. Because the theater world offers so much more now compared to the past, the logical decision for Atlanta Ballet’s creative team was to go with the times. This meant using new and advanced technologies such as video projections, lighting effects and other technical aspects. 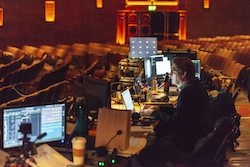 Lighting Designer David Finn using advanced techniques to enhance the magic of ‘The Nutcracker’. Photo by Kim Kenney, courtesy of Atlanta Ballet. Although a lot of the aspects seemed to fall into place with plans of a revamped production, the process was not short of its challenges as well. While Atlanta Ballet’s roots are firmly in Atlanta, Georgia, this did not deter Nedvigin from branching out to other outlets to form a powerhouse creative team in addition to an equally powerful ballet company. 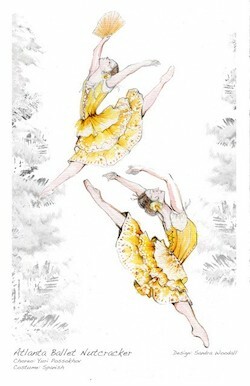 Atlanta Ballet’s costume design for ‘The Nutcracker’. Adding to the challenge of getting the most talented dancers together in one arena was figuring the ins and outs of utilizing everyone to bring the production of The Nutcracker to life. Because Atlanta Ballet has grown over the last couple of years, with the addition of Atlanta Ballet II, everyone served as a pivotal piece of one big puzzle to attach each piece of the production together to make pure magic. Throughout this process of utilizing each and every dancer, it was equally important to make sure that the choreography was one that could translate not only on the dancers’ bodies but to the audience as well. As Artistic Director, Nedvigin has seen firsthand how Possokhov works with his company as they come together to bring an innovative version of The Nutcracker to the big stage. The dancers are also getting a feel for how much work goes into bringing the vision to life through Possokhov’s intricate choreography. Atlanta Ballet company member Sergio Masero-Olarte discusses his experience working with Possokhov thus far. 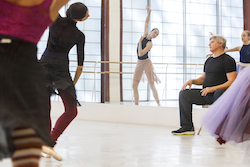 Choreographer Yuri Possokhov in the studio with Atlanta Ballet dancers rehearsing ‘The Nutcracker’. Photo by Kim Kenney. Although Possokhov has thrown some extensive choreography that is both technically and physically challenging, the caliber of his work cannot be denied, which is one of the aspects that will stand out in this revamped Nutcracker production. With the amount of organization involved, along with well thought out choreography for each role in the show, it is safe to say that Atlanta Ballet’s production of The Nutcracker will be one of imagery, fun and classical elements that the storyline thrives on — only on a higher note. This production will not only be about the dancing, costumes or even the sets, but instead about an entire unit linked together to make one great holiday favorite but for the next generation. Atlanta Ballet will have 19 performances of The Nutcracker, set for December 8-24, at the Fox Theatre. For more information on Atlanta Ballet and tickets to The Nutcracker, visit www.atlantaballet.com.